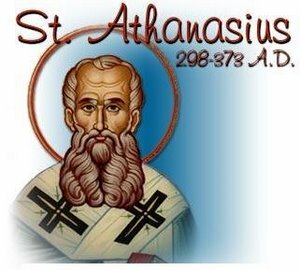 St. Athanasius was born in Alexandria, about the year 296, of Christian parents. In 315, St. Athanasius went to the desert to spend some time in retreat with St. Anthony, a hermit. In 319, Athanasius became a deacon, and he was called upon to take an active part against the rising heresy of Arius, a priest of the Alexandrian Church who denied the Divinity of Christ. This was to be the life struggle of St. Athanasius. In 325, he assisted his Bishop at the Council of Nicaea, where his influence began to be felt. In 326 Athanasius was unanimously elected Bishop. His refusal to tolerate the Arian heresy was the cause of many trials and persecutions for St. Athanasius. He spent seventeen of the forty-six years of his episcopate in exile. Athanasius died on May 2, 373. St. Athanasius was a Bishop and is a Doctor of the Church. If people ask, “Why did he not appear by means of other parts of creation, and use some nobler instrument, as the sun or moon or stars or fire or air, instead of merely man?” let them know that the Lord came not to make a display, but to teach and heal those who were suffering.